The newspaper you’re holding in your hand is turning 100 years old. Writers for The Signal have seen one heck of a lot of things over this past century, and they’ve diligently reported and opined on it, day after day, week after week, and year after year. I’m pleased to have been writing my Full Speed to Port for what’s going on 15 years now. These columns have been written through what’s been a very unique and actual strange time in America. Launched in revulsion to President George W. Bush’s fake and tragic war in Iraq, then following America’s recoil of Bush in electing Barack Obama, through the long slog of recovery from Bush’s Great Recession – and then of all things, to this circus presidency, this unimaginable degradation of our nation’s highest office – the ascension of something resembling more of a crime family organization than a White House organization – to this unlikely presidency of Donald Trump. And through it all, from Bush to Obama, I wrote, everyone at The Signal wrote, about real events and real issues. Things went down, we wrote about them. Real events happened, we wrote about them. There was a certain order and timing to the events, some expected, sometimes unexpected. Even in chaotic times like the banking crisis, there was still an expected process, and order – something that could be followed, digested, measured and explained. Today, not so much. We’ve reached Peak Chaos. You may have noticed, but at certain times the pitch and din out of the White House tweet and talk show circus propaganda machine reaches such velocity and volume that almost all real news and awareness of the world around us is pushed to the sidelines. My Lord in Heaven. Is that really all there is? Is this really America’s greatest concern? For nearly 250 years we’ve existed without a “big fat beautiful wall from sea to shining sea” between us and Mexico and now it’s our all and our everything. It’s not just that Trump’s glazed-eye 35-percent base (and falling) believes there are Mexicans under their beds robbing their homes down to stripped floors – it’s that “The Wall” is all the rest of us otherwise sane thinkers ever hear. “Shut down America” over a wall! Thirty-five days of dumb, all over the wall. Eight hundred thousand American workers, stiffed, over a fake, made-up wall fight that started even before the Democrats took the House in a wipeout rebuttal of Trumpism. The wall is our all. The wall has become our everything. Competing countries must be laughing their collective rear ends off. The Greatest Nation on Earth has been fully distracted from forward progress by a showman/madman waving his shiny object of a wall from Oval Office ramblings and States of the Union – dragging our eyes and ears away from important stuff and back into the abyss of… The Wall. The wall is Trump’s original marketing tool. The tangible, imaginable, marketing logo, dog whistle uniting Trump’s fearful white minority into a sizable combined voting block – sufficient to gain just enough “lost the popular vote” numbers to create a small and very unstable Electoral College victory. A victory that’s looking increasingly unachievable in 2020 as reality and rule of law and public judgement closes in faster and closer on Trump world. The Wall is one hell of a Hail Mary. Instead, “The Wall,” is our all. Never in The Signal’s 100 years, nor my 15, have we faced news about such nothingness. Continued national distraction away from actual, real, meaty concerns by an imaginary wall that will never ever be built but must be continuously hyped to deflect serious focus, inquiry and… public and legal judgement. Indeed, “The Wall” has been very successful for Mr. Trump. Distraction mission accomplished. Give Trump fair credit. He’s built that much. 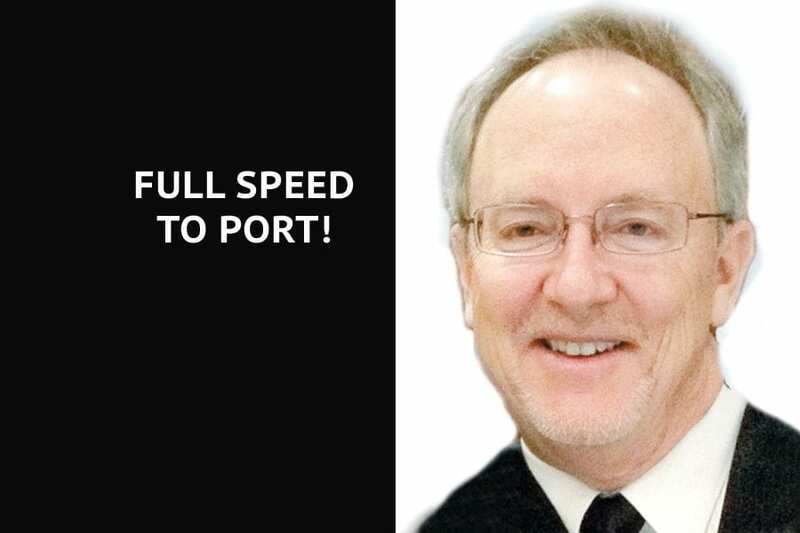 Gary Horton’s “Full Speed to Port!” has appeared on Wednesdays in The Signal since 2006.